Are you completed your undergraduate in B.Com? then go through this article for the B.Com Jobs 2019. 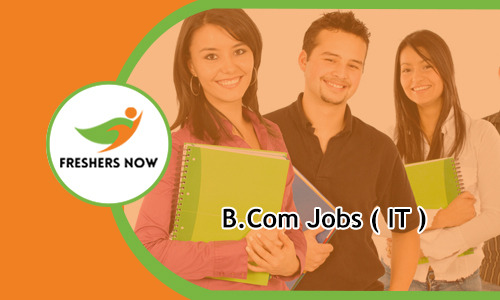 This page gives the latest B.Com Jobs 2019 For Freshers candidates who are seeking for the jobs in Information Technology Field. Many top IT companies are offering a huge number of opportunities. So the aspirants who had completed their Bachelors of Commerce in various specializations such as Commerce, Mass Communication, Administration, Advertising, Accountancy, Aeronautical Engineering etc can go check the latest B.Com Job Openings 2019 in various companies. In the next section, we are providing the company wise B.Com Vacancies 2019 for freshers. We suggest the aspirants go through this article completely and come to an idea about the IT Jobs for B.Com by specialization wise. Nowadays most of the B.Com undergraduate candidates are finding the jobs in the same file. But some of the aspirants are showing interest to move for the IT Jobs. To help those candidates we have created this page with full of latest B.Com Jobs for freshers. Making the career in the IT filed instead of in the same filed help the aspirants a lot. Jobs for B.Com freshers are available by course wise in the above table. Candidates can pick the job as per their interest in dream company. The competition for the jobs is increasing day to day. B.Com freshers can start their career as Marketing Executives, Senior UI Developer, Accountant, Personal Assistant, Digital Marketing Executive, Sales Executive, Accounts Manager, Video Editor, Junior Accountant, Administration Executive, It Software Engineer, Customer Interface Executive etc. So choose positions as per your interest and apply for the B.Com Job Openings 2019. Bachelor of Commerce is an undergraduate degree abbreviated as B.Com. This is an undergraduate course in the commerce and related subjects. The B.Com provides a wide range of managerial skills. Students can pursue this B.Com as a full time course or Part Time course. Bachelors of Commerce specializations are Honours, Advertising & Sales Management, E-Commerce, Computer Application, Foreign Trade, Office Management, Tax Procedure. Contenders who are hunting for the Jobs for B.Com graduates can check this page. Here in this article, we are providing the B.Com Jobs 2019 in India as well as abroad. Many of the companies hire the candidates by conducting the direct recruitment. But some companies conduct the Walkin Drives and Off Campus Drives to recruit the aspirants for various positions. To reduce the search burden of the aspirants we are providing the each and every B.Com Jobs for freshers on this page. The aspirants who are worrying about the jobs after B.Com can stop worrying. To reduce the unemployment problem a few of MNC companies and Startup companies are providing the number of Job Openings for B.Com candidates. The companies who register under the Companies Act compulsory need the Manager and Commerce Specialist to manage their business. So there are a lot of B.Com Job opportunities 2019 in the Information Technology field. The candidates best choice after B.Com is Charted Accountancy. Apart from the IT sector, there are many job openings in various employment areas like Banks, Marketing Companies, Educational Institutes, Budget Planning Bodies, Treasury Departments, Forex Departments, Public Accounting Firms, Foreign Trade Centres etc. Choosing the best employment area depends on the interest of the aspirant. B.Com aspirants don’t need to roam here and there for the latest and upcoming B.Com job openings 2019. We advise the aspirants to stuck on this page for the latest job updates. The willing candidates can apply by checking the whether their skills are suitable for the job openings. Orissa, Bengaluru, Delhi, Chennai, Mumbai, Pune, Kolkata are the major cities offering Job Opportunities of B.Com freshers. We are providing a direct link on this page to apply for B.Com Jobs 2019. Candidates can use that link, go through the details and apply for the required position. Applicants not to waste your time in searching B.Com Jobs. Keep visiting our website frequently for the latest job openings. Good news for the aspirants who are exploring for the B.Com Jobs. The candidates can also get the private job openings from this page. On this page, we are providing the best high paying jobs for the B.Com graduates. MNC companies will offer good pay scale for the aspirants who are recruited for various openings. The candidates can also check the B.Com Jobs 2019 in private sector as well as Government sector. To be the first person to get the job go through this page and get the latest B.Com Jobs 2019. Securing the IT Job after B.Com is not an easy task. The candidates have to work hard. To guide them in the proper way we are providing some of the important stuff like Syllabus, Placement Papers etc. Check the information first and come to and come to an idea about the topics related to the exam. After clearing the first round the candidates have to face the Interview rounds. Here candidate has to answer for various technical and personal questions. For the reference, we have given the latest Interview questions on our website. For more latest B.Com Jobs 2019 the aspirants can keep visiting our website Freshers Now frequently or regular basis.